Happy feels like Monday!!!! Today is the last day of the Holiday Mini Catalog!!! Lots of the items are on sale too! If you are one of those who gets their Christmas Cards done in January with the sale items from the season, click here to get these goodies! I just couldn’t not show this beautiful card. It’s got flowers, shimmer, and warmth! I used the First Frost Bundle and Frosted Floral Designer Series Paper!!! 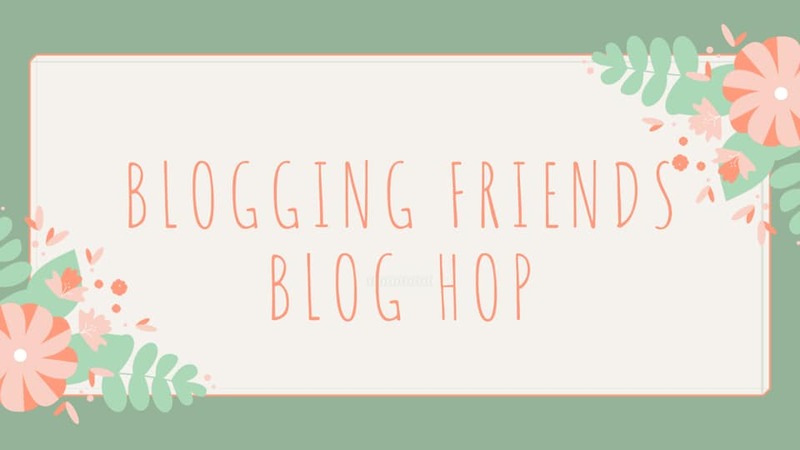 I love it so much and it’s great for lots of occasions! I started with a Mint Macaron card base. Then I layered on a piece of the Frosted Floral Designer Paper (3″ x 4″) on the bottom. 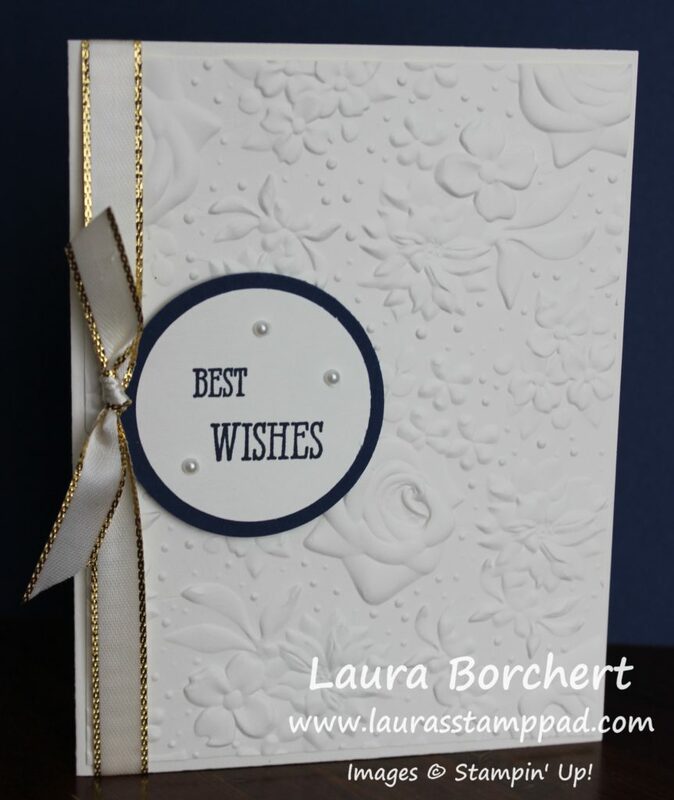 One the top, I embossed a piece of Tranquil Tide with the Layered Leave Embossing Folder and added it to the card front! 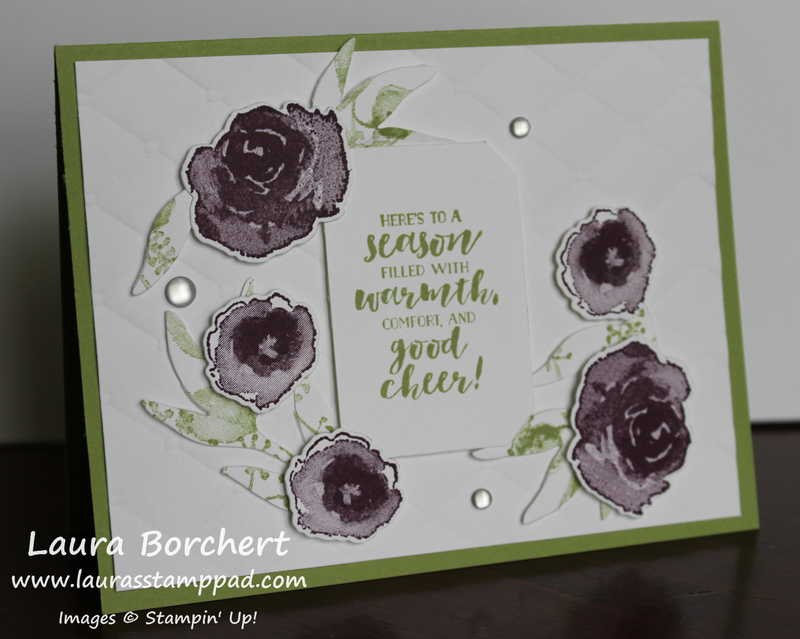 For the decoration, I stamped the flowers in Blackberry Bliss from the First Frost Stamp Set. The awesome thing about die cutting these flowers out is that there are multiple flower dies in the set. This cuts your die cutting time down a lot!!! The leaves were punched using the Sprig Punch and Leaf Punch. 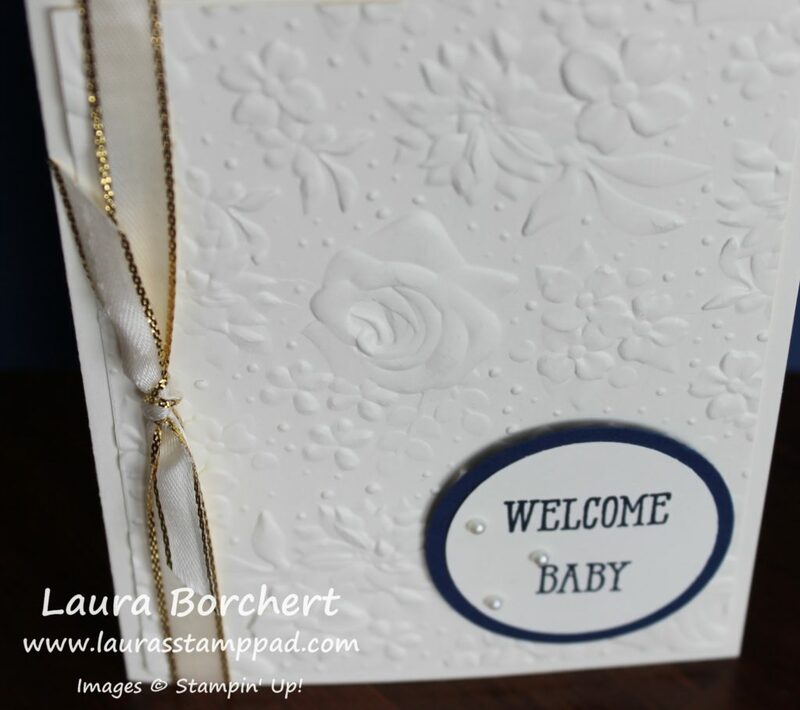 For the greeting, I used the layered greeting dies from the Frosted Bouquet Framelits. 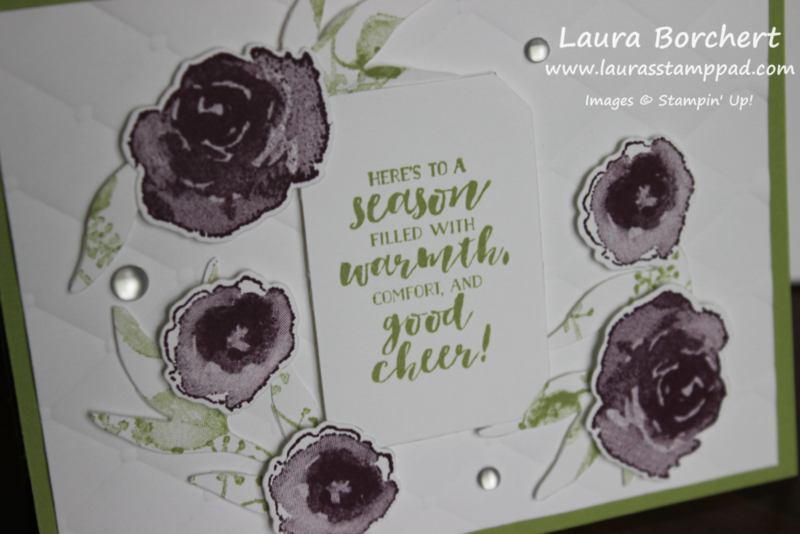 The greeting was stamped in Blackberry Bliss from the First Frost Stamp Set. I added the greeting with Stampin’ Dimensionals. Then I added all of the leaves around the greeting with Snail Adhesive. Don’t worry if there isn’t a ton of adhesive on the leaves because the flowers will also hold them on. I used Stampin’ Dimensionals on the flowers. To finish it off, I placed an Epoxy Dot in the center of the flowers for a little more shimmer! I love this color combination so much!!! Also, I have to mention that the First Frost Bundle is not retiring with the Holiday Mini Catalog. You can still purchase this bundle through the Occasions Mini Catalog!!! Woot Woot!!! Check out the supply list for this card below! Don’t forget that the Occasions Mini Catalog and Sale-A-Bration begin tomorrow! Turning Rhinestones into Gold Jewels!!! You all know how I love my bling! Rhinestones are my go to and I’m a silver girl but sometimes you need some gold. 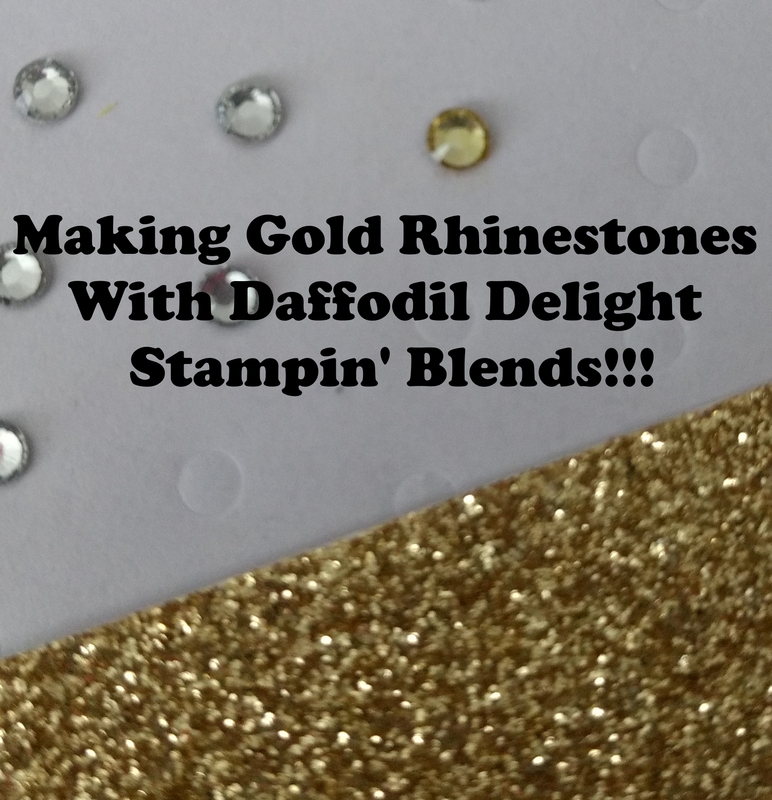 Today, I’m going to show you how turning rhinestones into gold jewels is possible too! Look how fabulous that is!!! 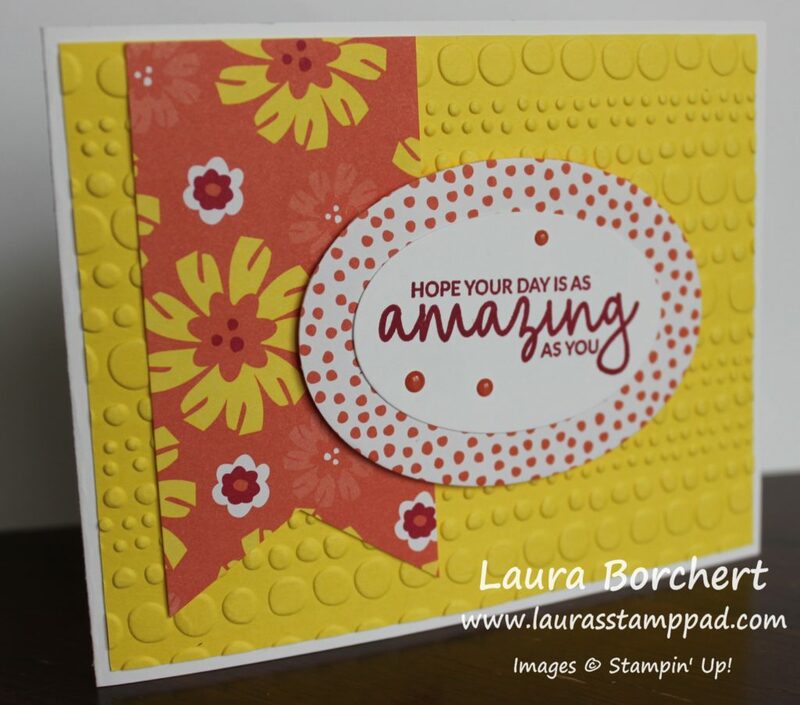 I simply took the Daffodil Delight Dark Stampin’ Blends Marker and brushed over the Rhinestones. Now you have gold rhinestones! It’s perfect!!! Here is a card that I used both silver and gold for! 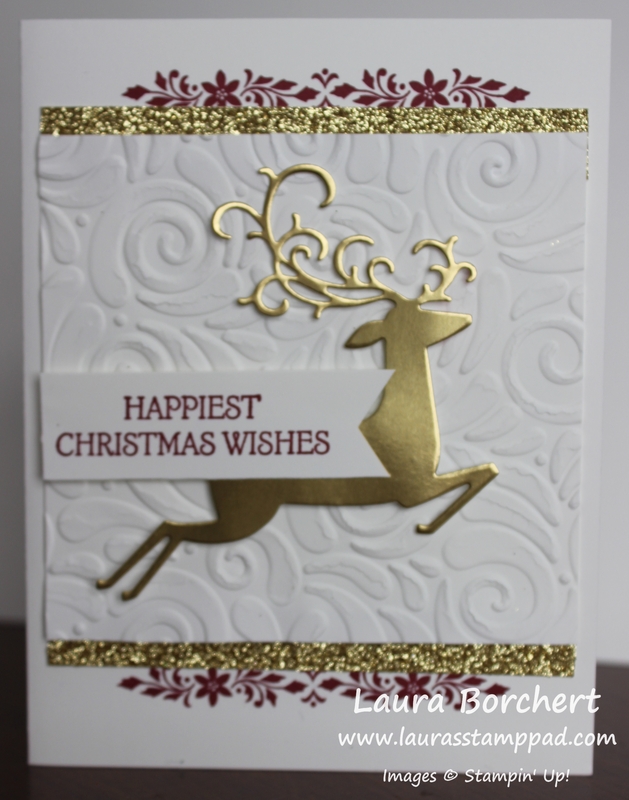 I started with a Whisper White card base and layered on a piece of Blackberry Bliss that I ran through the Big Shot with the Tufted Embossing Folder. This gives a little texture to the background. 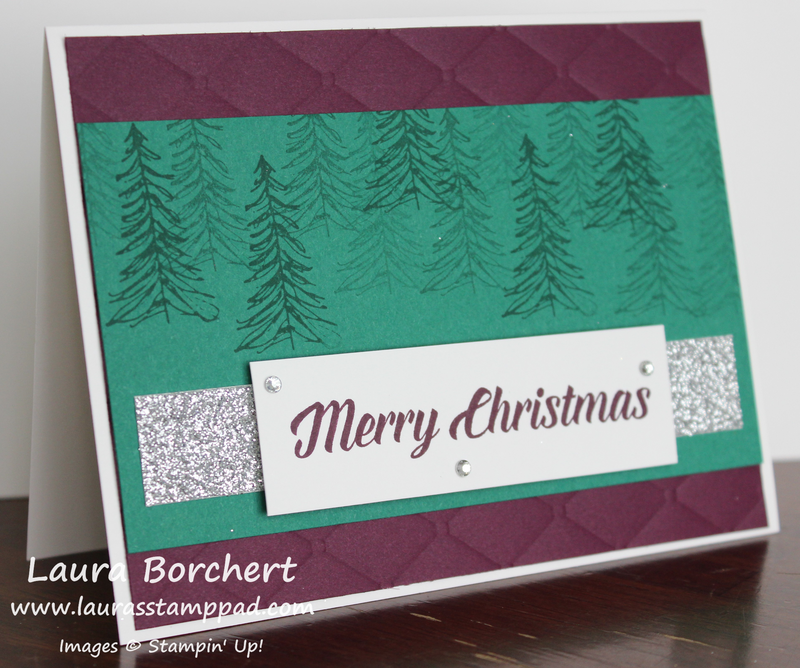 Next, I stamped the tree from the Timeless Tidings Stamp Set on a piece of Shaded Spruce cardstock. I stamped three times before going back to the ink for a variation in color. Also, I stamped up, down, up, down for a forest look. Then I added this piece to the card front. Using some Gold Glimmer Paper and Silver Glimmer Paper, I added a little strip down the bottom of the Shaded Spruce. This is a great way to use up scrap pieces. It just needs to be long enough to stick out the ends of the greeting. 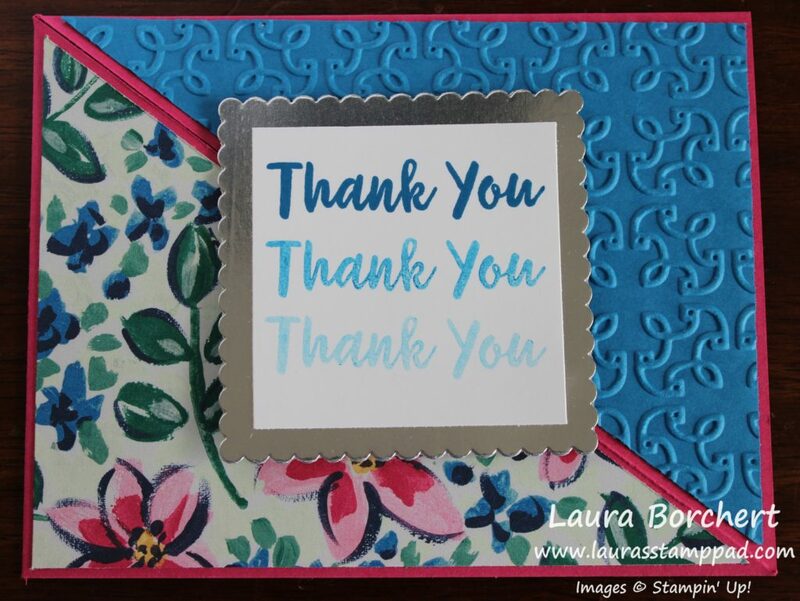 The greeting was stamped in Blackberry Bliss from the Timeless Tidings Stamp Set. To finish off the card, I added some Rhinestones to the silver one and some gold Rhinestones to the gold one. I love it!!! 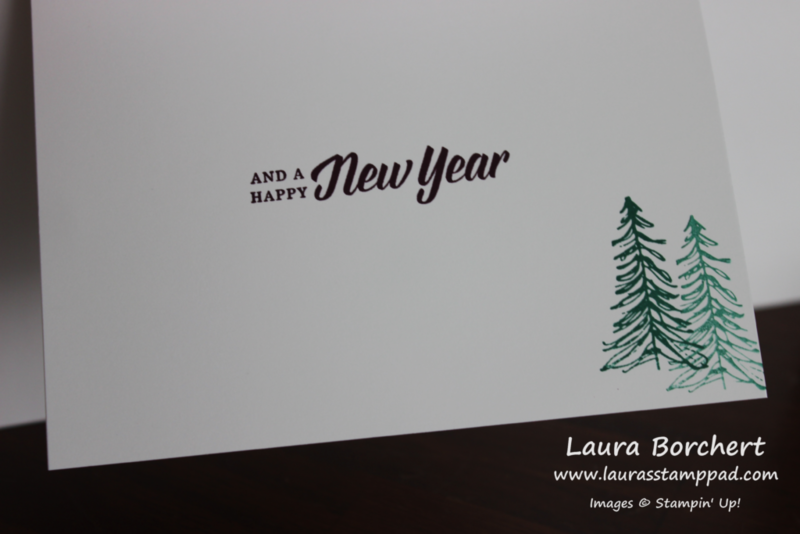 Here I stamped the inside of the card with the New Year greeting and a little mini forest! Super cute! Do you prefer Gold or Silver?? Let me know in the comments below! If you would like to recreate this card, click on the supply list below! 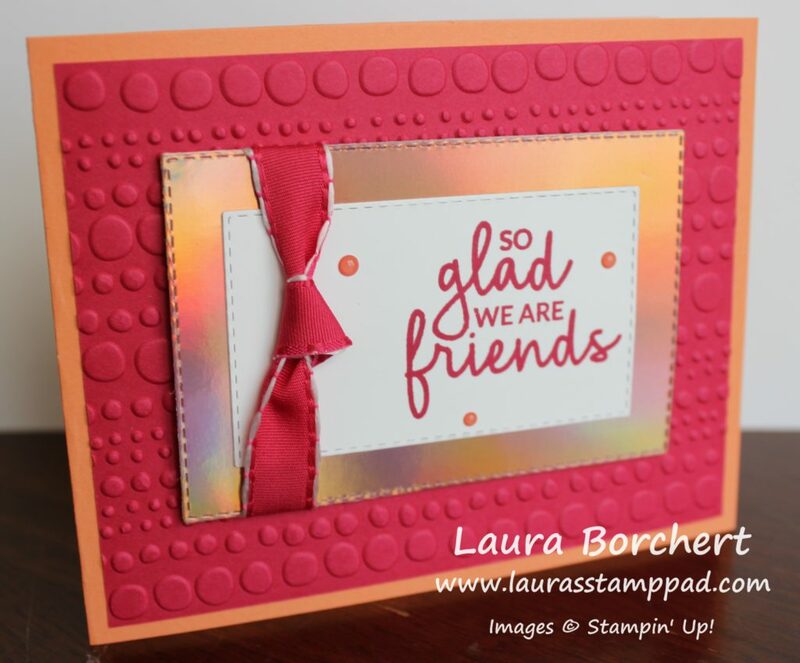 Have you ever wanted an image stamped in each corner of your greeting or project?? 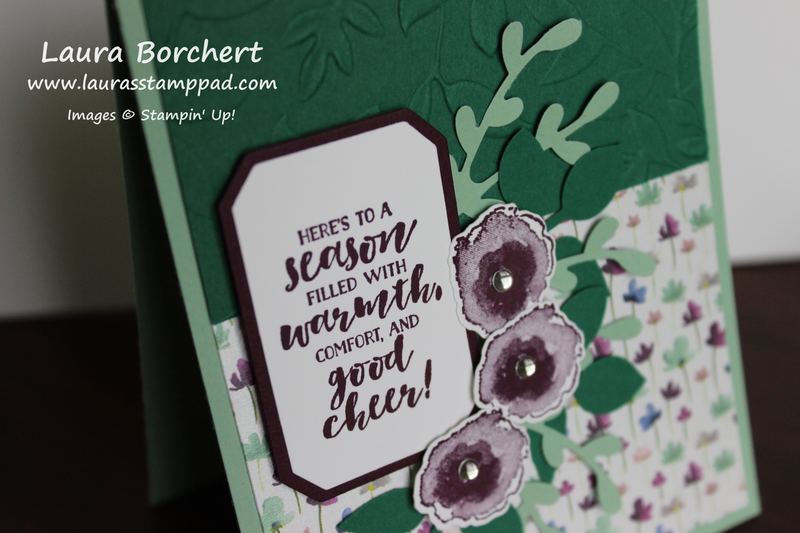 Today, I’m going to show you how stamping perfect corners is super easy!!! I am loving this greeting and it was super simple to create. Remember last week when I showed you Stamping In The Round??? We are going to use that same template for this card only this time, you just need to use the squares and not the diamonds on it! 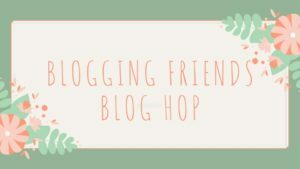 I started with a Blackberry Bliss card base. Next, I took a piece of Tranquil Tide measuring 4″ x 5-1/4″ to layer on top. 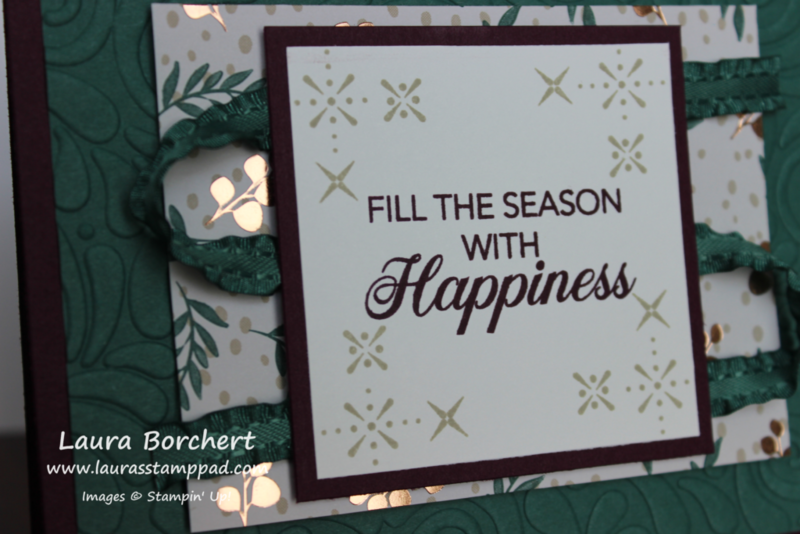 First, I thought it looked too plain so I stamped on it with the greenery from the Peaceful Noel Stamp Set in Tranquil Tide Ink. See the photo above. 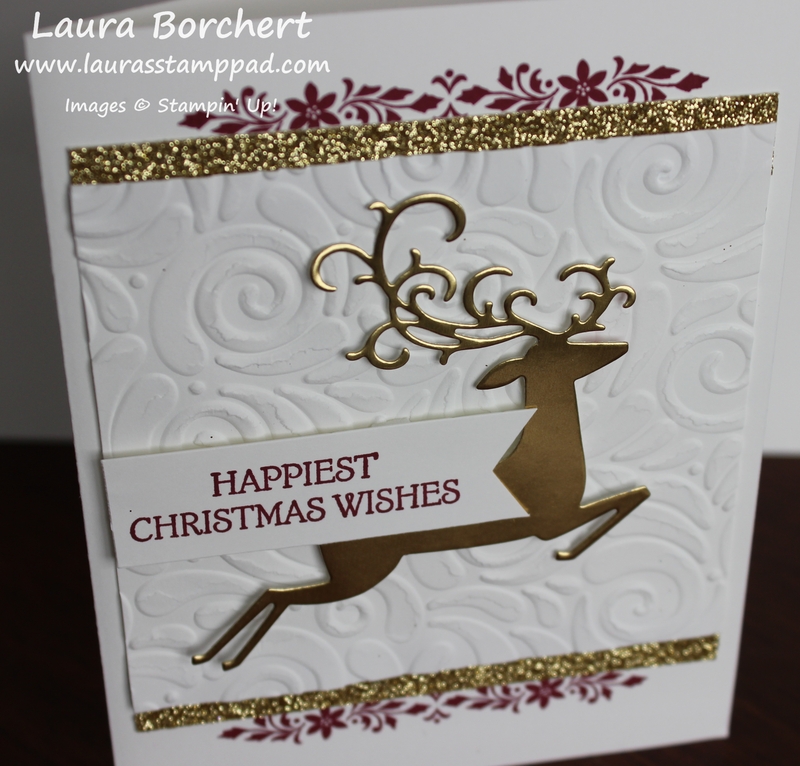 My husband said it looked too busy so I tried embossing it with the Swirls & Curls Embossing Folder. See the photo below! 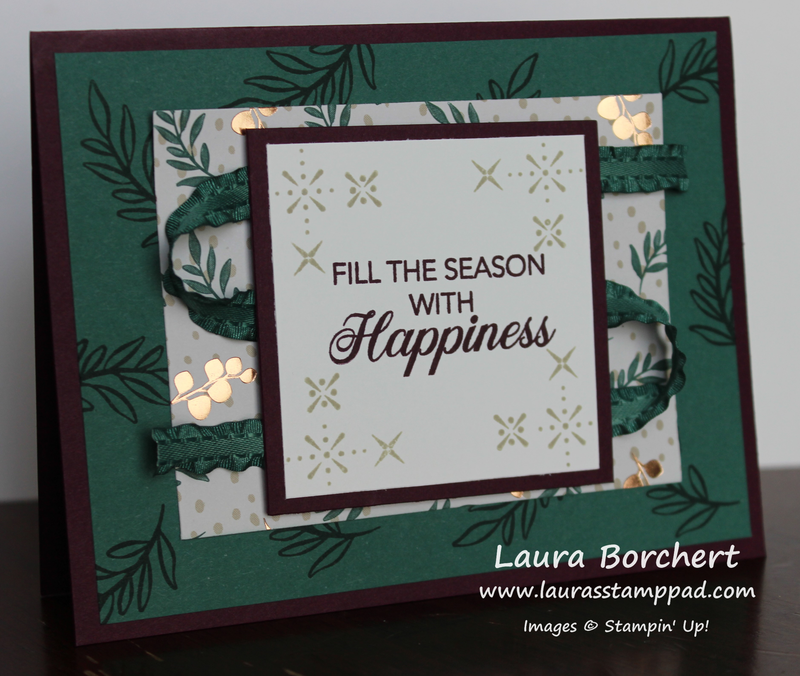 Next up, I layered on a piece of the Joyous Noel Designer Series Paper measuring 4″ x 3″. I used this size so I could use up every inch of the fabulous paper! 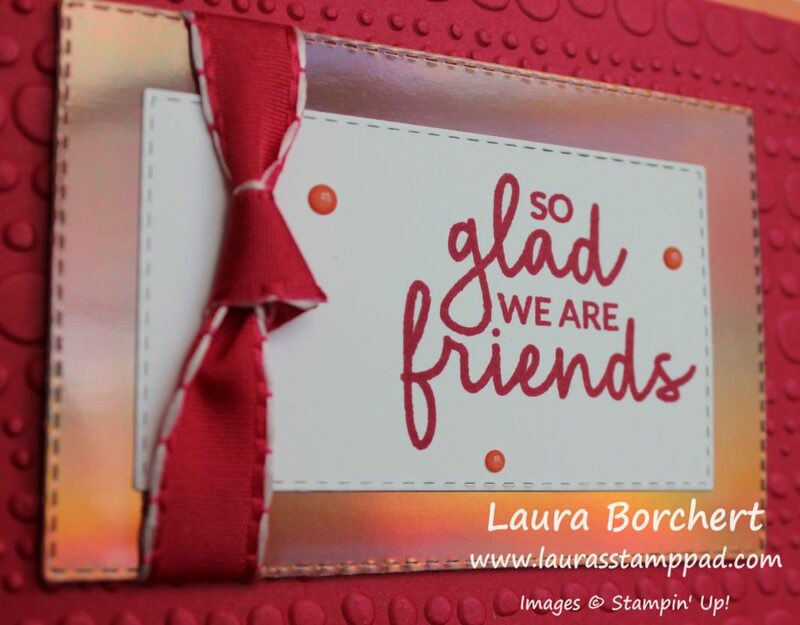 🙂 I like to add this layer with Stampin’ Dimensionals when placing it on an embossed layer because I feel it is more secure in the grooves of the embossing. If you go the stamped route like the sample up top, you could layer it on with regular Snail Adhesive. 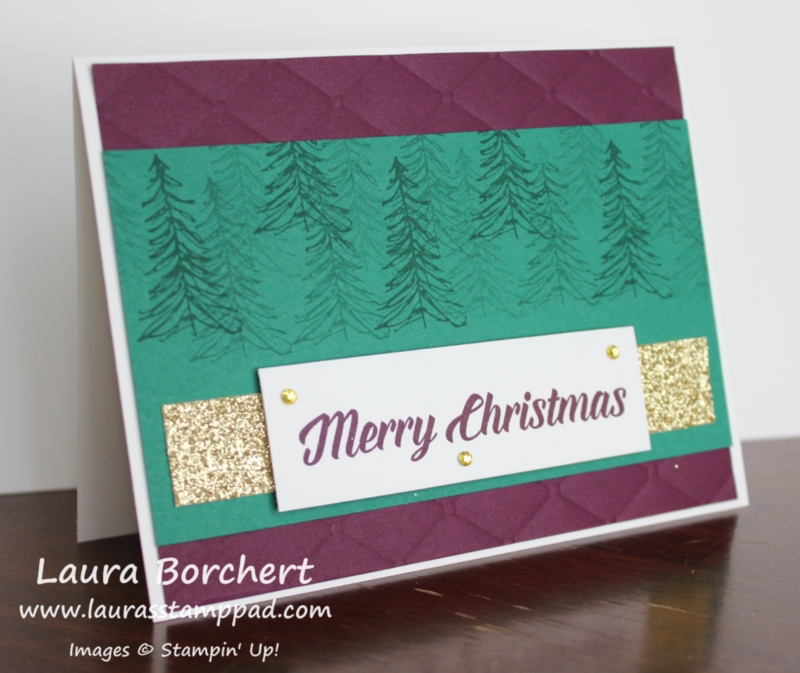 Using a 2-1/2″ square, I placed it in my Stamparatus using the square template. Then I stamped down the corner image in Sahara Sand Ink. 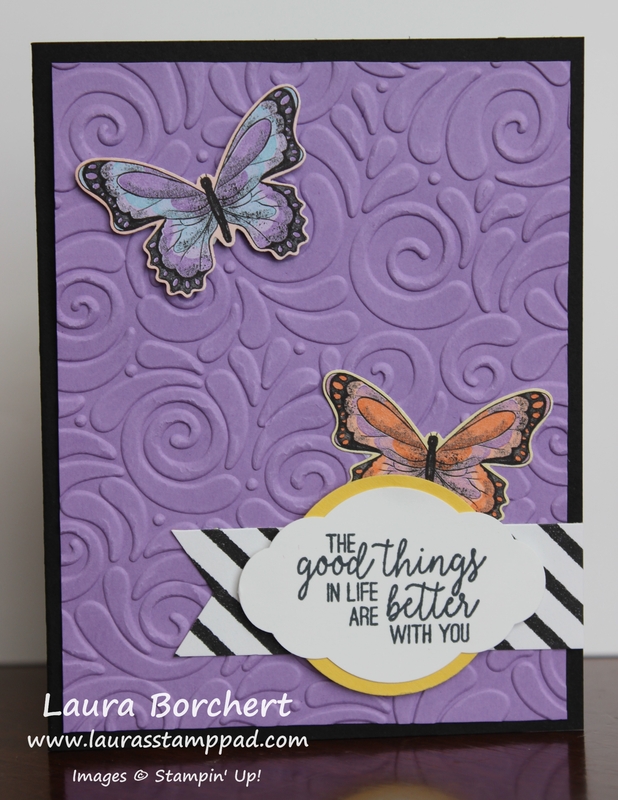 After, I stamped, I rotated the cardstock around so a new corner was placed in the stamping spot and stamped it down. 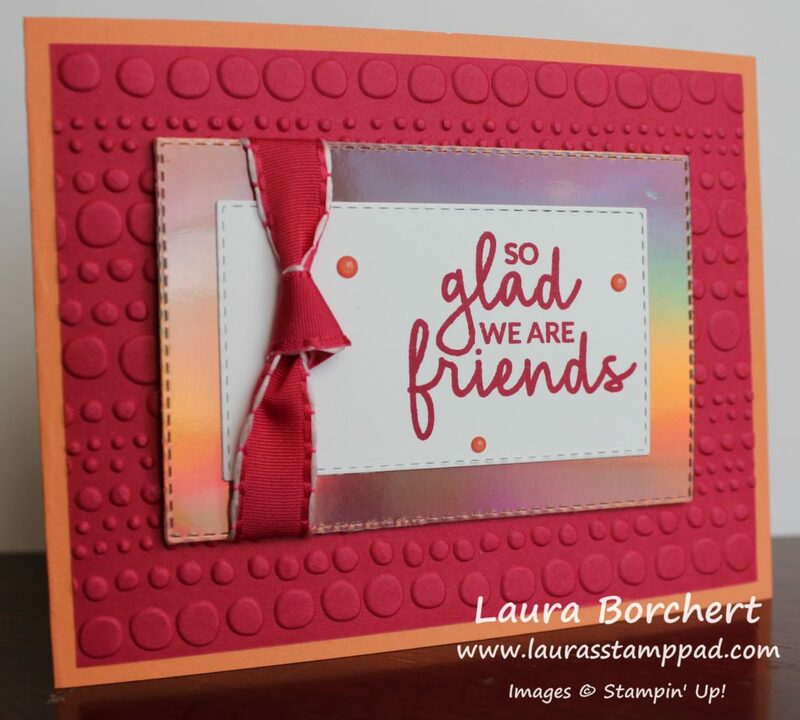 Once I had all 4 corners stamped, I stamped the greeting in the center. All of these images are from the Peaceful Noel Stamp Set. I layered this piece onto Blackberry Bliss. Using the Tranquil Tide Mini Ruffled Ribbon, I flipped over the greeting and placed it along the top with a bit of a tail hanging off. I secured it in place with Stampin’ Dimensionals placed half on the ribbon, half on the cardstock. Then I looped it around and secured the middle section, made another loop and ran the the last piece across the bottom. Once you have it all set, add a few more dimensionals for good measure. After all they are on sale today and I love them so much! Then I added this piece to the card front! 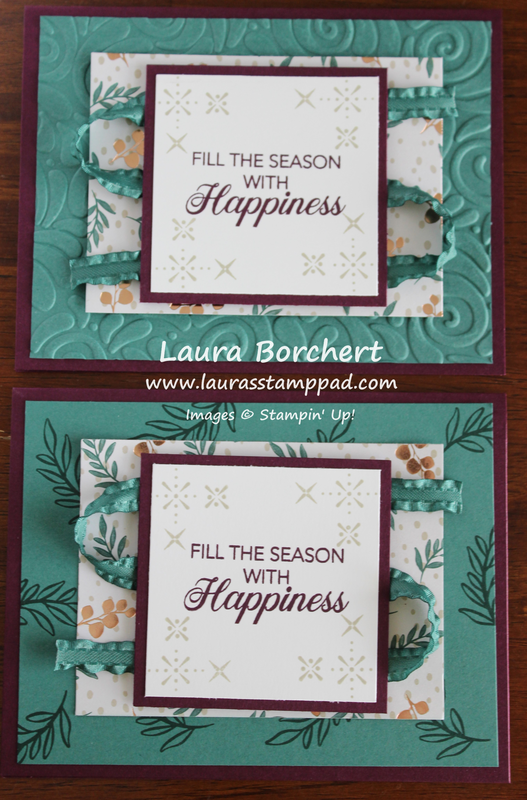 Which one do you like best – embossed or stamped Tranquil Tide layer?? Let me know in the comments below! 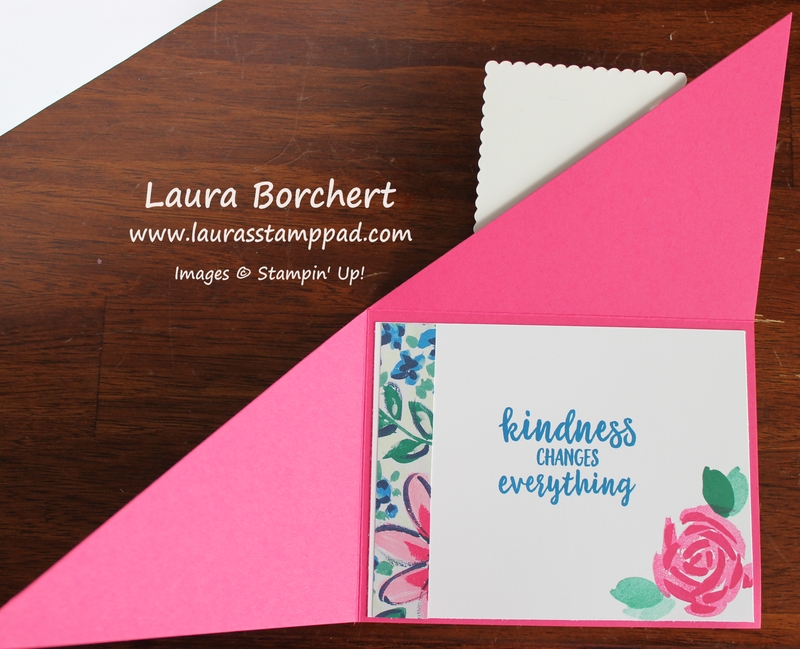 Technique Tuesday – Diagonal Opening Card!!! Happy Tuesday!!! You all know that means I have a fabulous technique to share. This one might not look cool at first but then when you open it you see the real magic. This diagonal opening card is super fun and the concept can be used for any occasion! Thank you to Margo Richardson for the amazing idea! At first, I started with an 8-1/2″ x 11″ piece of Melon Mambo cardstock. I cut it diagonally from corner to corner using the Stampin’ Trimmer. Be sure to take out the scoring blade and then the cutting blade will be able to cut all the way to the ends. Also, I recommend starting in the middle and pushing out so you don’t crinkle the corner tips. Now that you have a giant triangle, it’s time to score. Score from the corner over to 5-1/2 and up at 4-1/4″. This will create a 4-1/4″ x 5-1/2″ rectangle in the corner and two triangle flaps to fold over as the front of the card! Now that we have the card base complete, it’s time to decorate. For the inside, I added a piece of Whisper White measuring 4″ x 5-1/4″. 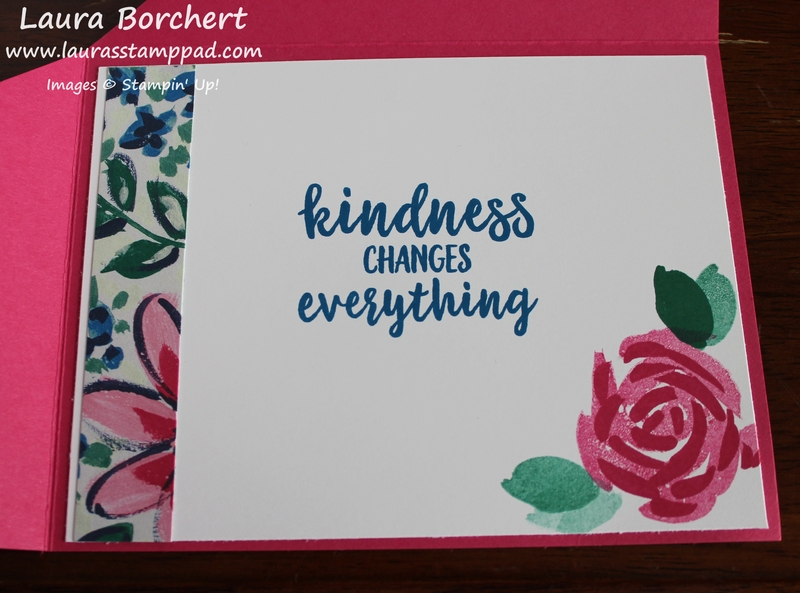 I stamped the greeting and flower from the Abstract Impressions Stamp Set. 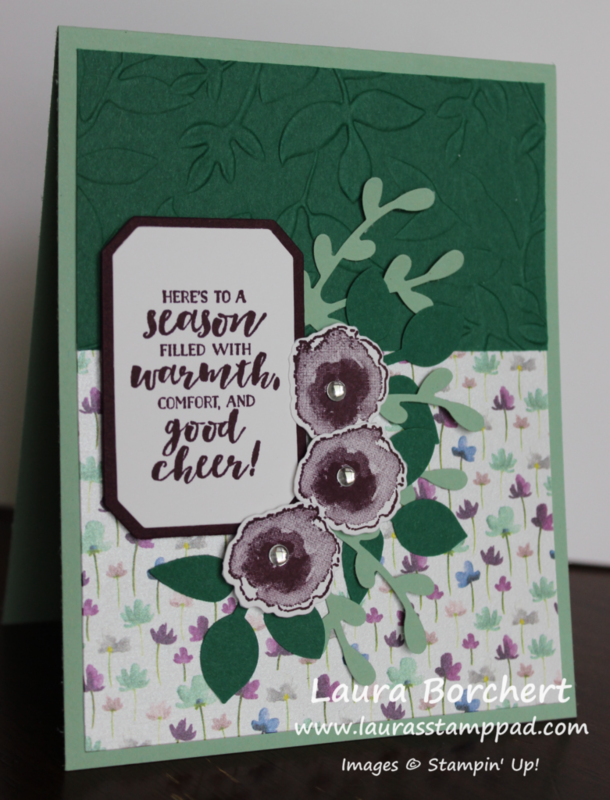 The greeting was done in Pacific Point Ink and the flower was Melon Mambo and Emerald Envy Ink. On the left hand side, I added a little piece of the leftover designer paper after cutting for the front of the card!